Special parking places for residents. Rey Chico Program. Carmen de los Mártires Surroundings. Publication on BOP Granada 28 November 2018 of start to apply for parking lots in Parking for Residents of Rey Chico. You can watch Announcement from 28 November 2018. And Provisional list of Awardees. One of the main points of the municipal institutions is to reduce the number of cars in the historical districts and, after a rotation parking system period, there must be a new way to understand districts and its functioning, giving more relevance to pedestrians than vehicles. 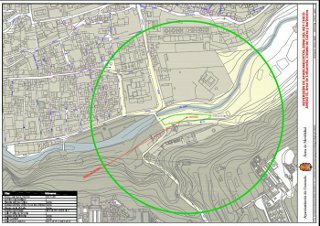 This means that it is necessary to rearrange the few free space priorizing the residents parking places in an ordered way, to avoid as much as possible,vehicles to get in these areas,even is in the same area with traffic restrictions as the Albaicín district. There is a necessity of priorize every parking zone for its neighbours, in attendance of the proximity to their houses, that means the main point to allocate every parking space to a user. 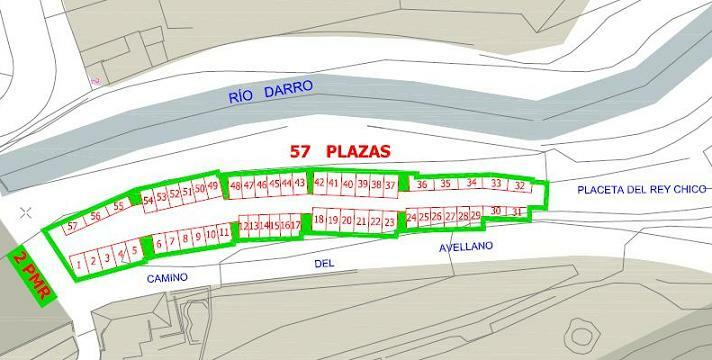 The zone in Rey Chico area (Puente del Algibillo) is the place to rearrange, in 2004 there have been stablished a parcel focused to be a parking for residents, with 57 places, created by the Albaicin Fundation to for its temporay use by residents of that area. This Programme wants to allocate, temporally and to get neccesary data to make a Parking Plan in this area, the priority of use in the parking places available. The public space available target of the Programme, is defined on Appendix 1, where a map of the Rey Chico area is shown, in Puente del Algibillo and a detailed map of the 57 places, plus 2 more for disabled people. The authorization made, will give access to this space in Rey Chico next to Puente del Algibillo, and park in any free place in the parking defined on the Appendix 1, and showing the authorization in the windscreen of the car, so it can be seen perfectly from the outside. Being title holder of a resident card and being authorized to acceed to the restricted zone of Down Albaicin, as the Municipal Regulatory Ordinance of Access Control says. Being resident, evaluating as resident those physical persons registered and living in the influency Area shown in Appendix 2. The vehicle to authorize must be a private car or similar. Besides the authorization there will be given to the owners an special distinctive with determined shape and dimensions, where it will appear the annual period authorized and the number plate of the vehicle. This distinctive must be situated or stucked inside the vehicle in the left side of the windscreen, to make it perfectly clear from the outside. The authorization must be in good condition to be checked any time. Applicants can not have rented or in property any parking place in buildings of the influence area. Only one vehicle will be authorized in each home in the Influenced Area. It will be better considered, the home with less distance between the gravity center of the parking and the applicant home, measured in a straight line, in horizontal projection, from the door of the applicant´s home. For applicants with same distance between those two points described in Appendix 2, the applicant who is more time registered in this address will have more right. If this antiquity is the same, lots will be drawn to decide the winner. If there are less applications than places in the parking, the specifications on the Appendix 1 and Appendix 2 could be modified, and the authorization of one vehicle per home, covering all the vacancies. Parking authorization has an annual fee to pay for the use of the parking service. This fee price will be determined in the Management Rules made. The authorization will be associated to the authorized vehicle and will show its number plate Also it can not be used and won't be valid in any other vehicle but the authorized, and in no other area of the city, with restricted parking place for authorized vehicles. 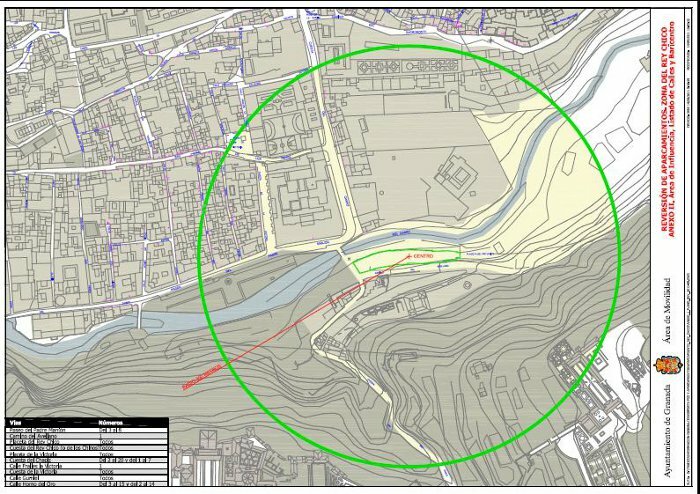 Influence Area map of residents that may appy for a vacancy, in a round area of 200mts surrounding the gravity point of the parking zone. It is an essential requirement to join the Programme to have a resident card and being authorized with Official By-law to acceed to the restricted area of Down Albaicin, as the Municipal Regulatory Ordinance of Access Control. The City Council will check it anytime. Identity card copy or Electronic Identity number and the driving license copy properly certified, where the address is shown and must match with the registered address. Driving license of some person registered in that address who has it. Certified copy of the vehicle movement license where must appear the same address and the applicant condition as title holder of the vehicle. Documentation to accredite that the applicant has a vehicle, that is the title holder made in a leasing, renting or system or similar. Documentation to accredite that the applicant has a vehicle, and the title holder is a legal entity, and located in the same address( copy of the deed of the society, where the address is shown). 4. Affidavit of not being owner, leaseholder or user of garages. There is an initial allocation period of 30 days , with an announcement in the edict board of the Junta Municipal de Distrito to submit the applications. The last period to submit applications in Rey Chico Programme is since 20 November until December 2.015. Mobility Department of this City Council, in Fuerzas Armadas Ave.,"Los Mondragones" Complex, Building-B, 2nd floor, (tel: 958-24 82 13) and the municipal web page. It will notify of this circumstance to hand the application, and notifying him that he should remove the car of this place if he is has not been selected or the application has not been submitted in time. After this period there will be exposed a provisional list in order of priority of the residents allocated, for 10 days in the edict board of the Junta Municipal de Distrito, in case there is any complaint. After this period, the vacancies will be allocated and notified to applicants (Final list). Before regularize being part of the Programme and allocate the applicant, he should accredite the payment of the fees to get this service. The City Council should have a Queue List for residents who applied for a vacancy and having all the requirements, didn´t achieve any parking place. When there is a vacancy (someone leaves the Programm), the City Council will notify it to the following resident in the Queue List (join in the Programme), and will give him an authorization. Any parking application, handed out of period, but fulfill all requirements, will be included in the Queue List. The authorization máximum validity will be one year, expiring on February 28st. After this period, a new authorization will be required. Authorized users, should apply on December of the previously year. In case that requirements have not been changed to achieve a parking place, users could attach a responsible declaration of having the same conditions as when the vacancy was designated.If there is any variation in their requirements, they have to attach the documents specified on point 4. However, this application doesn´t guarantee the right of use of this parking place. The City Council will make a new provisional list of allocated residents in order to priority, and it will be exposed for 10 days on the edict board of the Junta Municipal de Distrito, in case of any complaint. After the period allowed for submissions, all the vacancies will be allocated and notified to applicants(final list). The City Council could check, at any moment, the applicants requirements and conditions stablished on the Programme, cancelling those who doesn´t, with their respective file. People whose have been given this authorization will be responsible of it and when they change their address or vehicle it could be given, at his own request, a new authorization for the new address or vehicle, if its being included in the influence area, and if they return the previous authorization and fulfill the requirements. The user disobedience will imply the cancelation of the authorization and leaving the Programme. In the parking place any modification or intervention is completely forbbiden, as well as the installation of any unauthorized element. This behaviour means the cancellation of the authorization, apart from all the legal procedures that may proceed. The authorization is personal and non transferrable and is only give the right to use the parking space. The City Council of Granada won´t be in any case responsable of damage, robbery or stealing in the vehicles parked. Authorization could be cancelled at any moment, and will have no effect if the requirements are breached and must be revoked when the circumstances that motivated the allocation dissapear or some other appear that if existed when application was formalized, will justify it refusal. On those cases, the title holder of the authorization won´t have any right of compensation but the refund of the money, divided in quotes. In case of robbery of the authorizations, the applicant, have to hand a copy of the police report and the application as well. In case of lost, the applicant must hand with the authorization, a responsable declaration to get another authorization. In case of damage, along with the application, should give the authorization. The municipal inspection services could check anytime the correct use of the parking places and the parking facilities. To optimize this Programme, prioritizing the use of the residents, there will be installed traffic signs as "Prohibido Estacionar" (No parking), "Excepto residentes expresamente autorizados" (Except for residents properly authorized). The Local Police could remove the car parked in one of the places shown in Appendix 1 without authorization ori f it has other car´s authorization. The Local Police and the Municipal Services could remove the vehicle, if it shows a different accreditative distinctive from the authorized or it has been manipulated. This Programme is an Experimental Pilot Plan and will last four years. At the end, the Technical Service will make a parking plan for the district that will be approved by the pertinent municipal authority. Publication on BOP Granada October 1st 2016 of the Approval of extension of the Programme of Parking for Residents of Rey Chico. 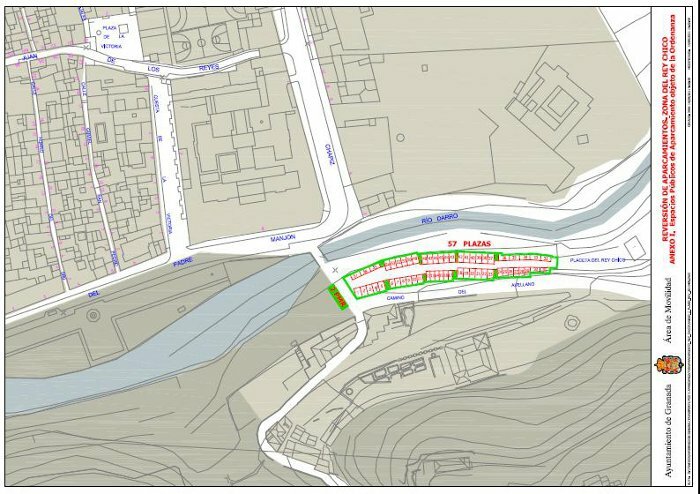 Last open call for apply to get an authorization to use parking spaces in Rey Chico is from 28 November to 31 December 2018. You may not to apply out of this open call. Your application will not be authorized. Apply with declaration of responsibility that explains the applicant continue with the same conditions that let the applicant obtain the parking lot authorization (if the person authorized last year don't apply this documents we understand that he/she abandon the Program). Documents before must be apply in Municipal Offices for Registration, or in other way established in art. 38.4 from Law 30/92, of November 26th . After December, will proceed to the allocation of places to the people living in the area. "to approve the stablishment of public fees for the service of parking in Rey Chico includen in the programme of Parking for Residents, that is settled in 169.68 € car/ year, proceeding to publish them to be efective". 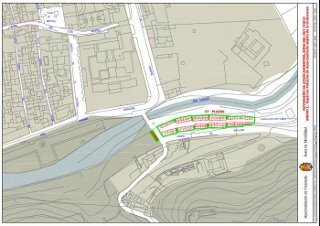 Local authorization for certain vehicles to park in the flat area of Carmen de los Mártires. Applicants of these procedures are the residents of the area of Carmen de los Mártires, and workers of places close to this area (Alhambra Palace Hotel, employees of Carmen de los Mártires, etc.). It is neccessary to attach the documents of the vehicle (driving license, technical specifications, and insurance in force), also the certificate of municipal register or any document to prove that the worker provides it services in a working center in the area (it may be a payslip or company certificate). At present, there is no fare or any other tax stablished.